Update: I built this theater a number of years ago and put these pages together to share the experience. Since that time, we sold the house it was in and left the room to the new owners. The information here is clearly outdated, but in the interest of not deleting history, I'm keeping them online. Wow! What's that mean anyway? Well, it turns out, that's what all my guests said when they saw the special LucasFilm WOW laser disc I showed to all first timers in the theater. The next thing that happens is I'm asked, "Where's the popcorn machine?" As it turned out, popcorn wasn't as popular house as Hershey's chocolates, Tootsie Roll Pops, Banana Bites and other assorted individually wrapped treats. That was okay with me because popcorn makes a pretty big mess. Saturday night at the movies happened upstairs in the home theater. I built it over the garage, which consumed six months of my extra time in '90-'91. It was kind of like a full time, part time job. Most days, I came home, ate dinner, changed clothes and went to work in the theater till 10:30 or later. It really didn't start out as elaborate as it ended up and was far past being a fun project before it was done. But it was worth it. It was fun hearing what visitors said as they entered the door the first time. At the time most people didn't think a home theater was more than a TV and a few speakers. Since this was one of the very first installations of this Runco projector, Runco used the picture of the theater in their IDP-900 brochure. Sam Runco even came to personally help set up the projector. 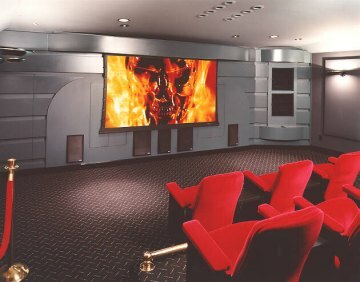 The Terminator screen picture was taken separately and digitally composited onto the room picture. It's an interesting picture because at no time does the room ever have enough light in it to make it look like the picture. Even pictures I tried to take showing other parts of the room come out marginal because the room was designed to absorb light, not reflect it. There are seven red velour theater seats, three in front row and four in the back row. Each has its own armrests and is connected to the next with a small table to put your snacks on. The rear seats are elevated on a platform that has two 12" subwoofers pointed up under the middle seats, with ports out the front and each side. Kinda gets that part of the room moving during bass intensive parts of movies. My favorite. Actually, the whole room moved because I also had two 18" subs that ported into the middle of the room through the ceiling and two more 10" subs in front wall under the screen. The equipment details are available on the technical details page. While we had the theater, except for major action / adventure releases, I stopped going to movie theaters. I felt that the money I saved helped offset my buying laser discs and building our movie library With essentially all discs having Dolby Surround then or now Dolby Digital encoding, or discs that are mastered under the THX laser disc certification program, our sound was generally better at home than even the best commercial theaters. At least at home, I had control over the volume and level of bass, always got to sit in the middle, and never had to share my armrest with someone next to me.